The second hole at Hyland Hills Golf Club in Southern Pines, N.C. It's easy to confuse the Pinehurst area with Pinehurst Resort. After all, Pinehurst Resort is home to one of the world's most famous courses (No. 2) and hosts numerous USGA championships (including the U.S. Open). People often lose sight of the many other great golf experiences the region offers. 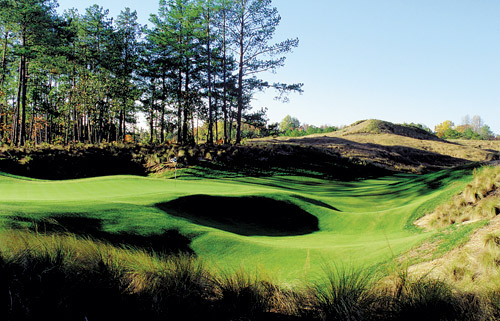 From Pine Needles (site of three recent U.S. Women's Opens) to the former sand quarry aptly named "The Pit," the Pinehurst-Southern Pines-Aberdeen area has enough golf to keep you swinging for nearly a month and a half straight. Of course, great golf isn't the only reason to visit this part of the country. For starters, southern hospitality is alive and well here, so it's the perfect getaway from hectic city life, and although August and September may be the dog days of summer, now's the most affordable time to visit this kid-friendly area with your family. Regardless of when you go (or whom you go with), to not visit would be to miss out on one of the country's best golf destinations. The Pinehurst, Southern Pines and Aberdeen region has 43 golf courses in a 15-mile radius, including eight courses at America's largest golf resort, the Pinehurst Resort. Legendary Scottish architect Donald Ross designed a number of courses in the area including Pinehurst Resort's No. 2 (he lived off its 3rd hole), Pine Needles Lodge and Golf Club, and Mid Pines. The late Mike Strantz had a reputation as a "Maverick" designer. See why at his Tobacco Road, a challenging, jagged swath of land that tempts golfers from all over the world. 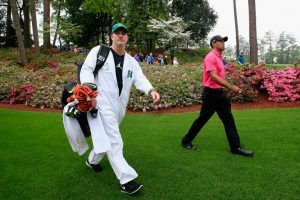 Like to walk but don't want your caddie to help you read greens? Hire a llama (yes, a llama) at Talamore Resort, where you'll find a limited number of these pack animals to lug your sticks around the course. Is it a novelty? Maybe, but the course holds up; it was designed by Rees Jones. The Country Club of Whispering Pines is an Ellis Maples design. Attending a golf school in the Pinehurst region is almost as popular as playing golf. 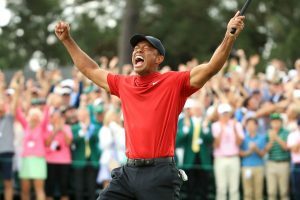 The area boasts five different highly reputable schools including Peggy Kirk Bell's "Golfaris" ("an expedition for golfers who want to improve their games and have fun") at Pine Needles, and the recently opened Pinehurst Golf Academy with its indoor hitting bays, putting studio and covered practice area. Other schools include facilities at Longleaf Golf & Country Club, Pinewild Country Club and The Pit Golf Links. 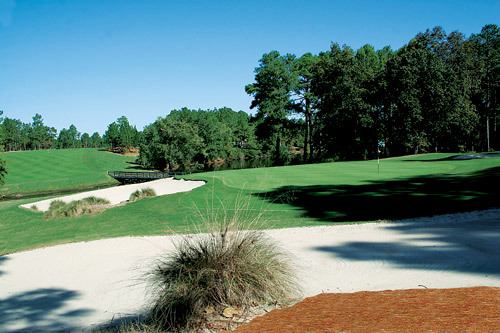 Country Club of Whispering Pines Play three rounds of golf on your choice of five different courses. Includes cart, two nights in villa lodging and continental breakfast. From $219. Valid thru September 14, 2008. For more information, call (800) 334-0589 or (910) 949-4323, or visit www.whisperingpinesnc.com. Pine Needles/Mid Pines Summer Golf Special. 36 holes of Donald Ross-designed holes. Pine Needles greens fee: $125, Mid Pines: $80.00. Good thru September 3, 2008. For reservations, call (800) 290-2334. 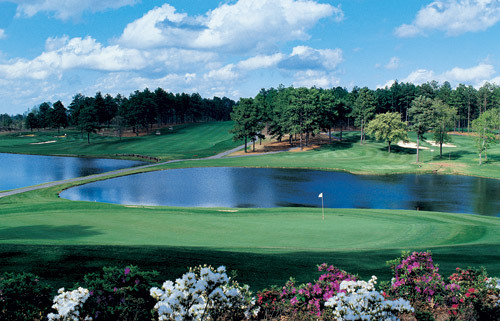 Pinehurst Resort Summer Escape Package. Either one round of golf or two spa treatments for each night booked. Accommodations, breakfast and dinner daily. $329 per person, per night. Call (800) 487-4653 to make reservations. The 18th hole at Mike Strantz' tough Tobacco Road. Just about every type of accommodation is available in the Pinehurst, Southern Pines and Aberdeen area, including bed-and-breakfasts, motels, hotels, condominiums and luxury resorts. If you like to stay at "all-inclusive" resorts with golf, dining and other amenities just a short walk away, then it's hard to beat Pinehurst Resort, Pine Needles and Mid Pines Inn. If you plan to explore the area, then you might want to stay at one of the area's many historic bed-and-breakfasts. It's "1781," and the "Tories" and "Whigs" are duking it out_â"again. For more info, call (910) 947-2051. The world's best amateurs converge on Pinehurst Nos. 2 and 4. Visit www.pinehurst.com/amateur-2008.asp. Located at Pinehurst Resort, this festival promises to please oenophiles and gastronomes alike. Call (800) 487-4653 for more. The German tradition comes stateside, and a month early, at the Pinehurst Harness Track. Call (910) 295-0166 for more info. Horse handling at its finest. Pinehurst Harness Track. Call (910) 693-1769 for more information. A number of online resources contain great information on the area. Have no a lot of money to buy a house? Worry not, because it is available to get the business loans to resolve such problems. Hence take a consolidation loan to buy all you need.